I've been having an awful lot of trouble lately putting together a pitch/query for my novel in preparation for the Rutgers One-on-One Conference. Since the FNC has been having so much fun using Disney for YA writing advice/exercises, I decided to take it one step further --- pitching my favorite movie, Beauty & the Beast, as a modern-day YA novel. YA character studies on Aladdin, Ariel, and Belle and even a Disney prince smackdown between Charming and Philip. I figured if I attempted to write "back of the book" copy for Beauty & the Beast, it might help me write a pitch for my own novel! There's no one way to write back copy, but no matter what, it needs to entice the reader. My format's going to be: A basic picture of the MC and her world -- the setup of the plot. Then an introduction of the conflict and the hook. When Belle pictured a life of adventure, it definitely didn't include moving to a small, sleepy French town with her eccentric father. Her days consist of reading books, feeding chickens, and avoiding Gaston, the town hottie who doesn't quite get that all brawn and no brain don't make her swoon. But when Belle's father leaves for a business trip and doesn't return, her entire world stops. Panicked, she follows his trail to a dark, imposing castle in the middle of the forest. She never expected to find an angry beast holding her father captive, or the magical enchantment that binds everyone who lives there. Trading her freedom for her father's life, Belle roams the castle, an eternal prisoner. She soon realizes that there's more to the enchantment--and the people under it--than she'd first believed. But she doesn't know that she's the only person who can save them all ... if she's willing to risk everything. Alright... tell me the truth here: would you read this if that teaser was on the back of the book? What I'm most happy about -- the opening sentence. It was actually harder to write the plot in modern language than I thought (calling Maurice's trip to the fair a "business trip" made me giggle). I'm least happy about the second sentence because it's a pretty clunky way to set up her life. Any better ideas? What do you think of the ending? Should I have hinted that the saving involves falling in love? Or is it even too much/too cliche to include the "risk everything" part? Can you tell this is something I struggle with? I'd much rather write dialogue! Help! 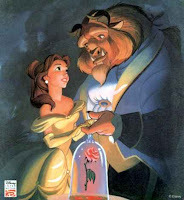 What's interesting is there isn't even one mention of the Beast-or the fact that this is a romance-she is risking to save those under the enchantment-but we never realize (assuming we've never heard of Beauty and the Beast and this is a real YA backcopy) that a major part of that is saving the Beast. This is a tough exercise! I mentioned the beast once ("an angry beast holding her father captive") -- but you're right, I didn't mention the romance! That's crazy! Especially considering that's my favorite part of the whole darn thing. Honestly, I think I just ... forgot ... that if this were a YA novel, no one would just KNOW that it was an epic love story. Oops! She soon realizes that there's more to the enchantment--and the people under it--than she'd first believed. She may be the person who can save them all--if she's willing to risk everything...even (including? especially?) her heart. hm as much as the love is intregal to the plot, I like that you didn't mention it...if I was reading the story for the first time, it would be a surprise and I like that.